''Frank was my first big league manager. I still remember being so nervous to walk into his office and introduce myself. He was a living legend and I was a 20-year-old kid right out of college. I can honestly say that meeting was the last time I ever felt that way around him. From that day on, he took care of me and treated me like a son. He was hard on me and at times I wondered why. I'm positive my career was shaped by the way he treated me and pushed me to be a professional. He taught me so many lessons about baseball and life that I will keep with me and pass along to teammates, friends and even my two daughters. We kept in touch through the years with phone calls, breakfast or lunch when I was on the West Coast and locker room visits. ... Thank you Frank for all that you did for me. You made baseball, and more importantly this world, a better place.'' - Washington Nationals star Ryan Zimmerman. ''He had a huge influence on me when I first came up in '63. I got to play with Frank for three years. Frank was a really aggressive, hard-nosed player, and it rubbed off on everybody. Frank was the one who took me under his wings, so to speak. ... Frank consistently talked to me about playing the game the right way, and I remember watching him break up double plays. Players used to tell me opposing managers in meetings would tell their pitchers, 'Don't knock this guy down because he will get up and hit it 500 feet. Get him out but don't knock him down.' And nobody knocked Frank down.'' - All-time hits leader and former Cincinnati Reds teammate Pete Rose. ''Frank Robinson was a dear friend and realized one of Jack's great hopes, becoming baseball's first African-American manager. He was remarkable and made us all feel proud for his many contributions to baseball and to society.'' - Jackie Robinson's widow, Rachel, and daughter Sharon. ''Today is a very sad day because I lost not only my teammate, but also a very dear friend. I loved Frank and got to know him so much better after we both retired. I spoke to him a few days ago and he sounded good. He wanted to be home. ... As a player, I put Frank in a class with Willie Mays, Hank Aaron, and Mickey Mantle. He was the best player I ever played with. When he came here in 1966, he put us over the top. He was a great man and he will be deeply missed.'' - Former Baltimore Orioles teammate and Hall of Fame third baseman Brooks Robinson. ''Frank Robinson's wife, Barbara Ann Cole, once said, ''He believes in rules and he respects the game. He reveres the game.' When I presented him with the Presidential Medal of Freedom in 2005, I noted that 'Baseball fans across America will tell you the feeling is returned. 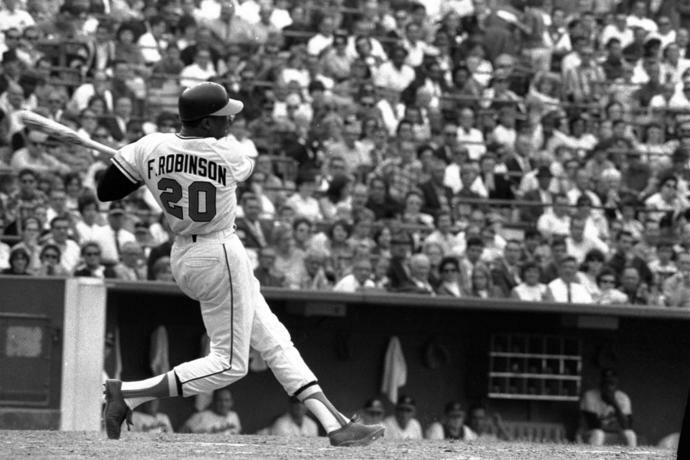 In the game we love, few names will ever command as much respect and esteem as the name of Frank Robinson.' No. 20 was the only MVP of both the American and National leagues, the first African American manager in Major League Baseball, and a Hall of Famer I was proud to claim as a fellow Texan. 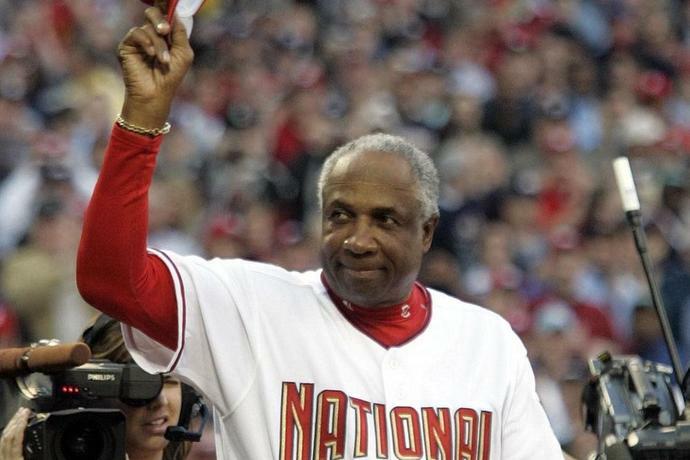 Laura and I are grateful for all that Frank Robinson did for our nation and our nation's pastime, and we send our heartfelt condolences to Barbara and the Robinson family.'' - former President George W. Bush. ''He was a tough nut. He was tough to pitch against because he just hung over the plate and he didn't care if he got hit, not that he wanted to get hit, but that's the way he did his job the best. He slid hard - clean. Played the game really with a lot of passion. And then, of course, I got to know him afterwards, both of us here with MLB, and he never lost that feistiness, which puts a smile on your face. I used to go up and hug him, which was never a comfortable thing. But he never resisted. But he never lost that passion and again like most of us old guys, looks at the game and says it's different than what it was. ... He had that presence. He never stopped competing. ... He made the rounds, but he was always that guy that commanded a lot of respect and he had a presence about him.'' - Hall of Famer Joe Torre, who played against Robinson and later worked with him as a Major League Baseball executive. 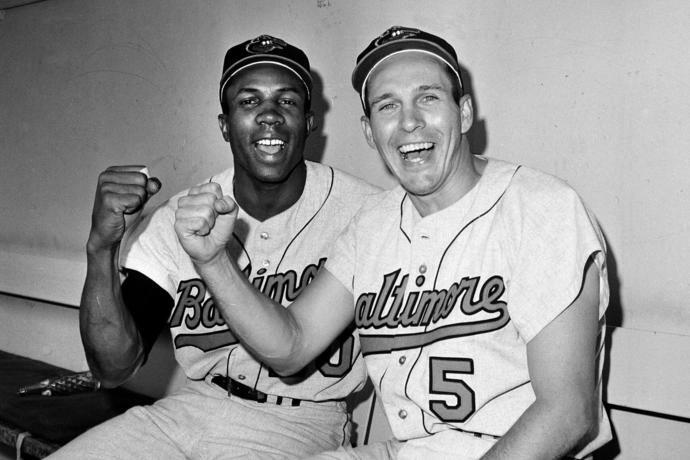 ''Another sad day in Birdland with the passing of Frank Robinson. Played the game tough, hard but fair. Made all of us better players, and winners.'' - Former Orioles teammate and Hall of Fame pitcher Jim Palmer. 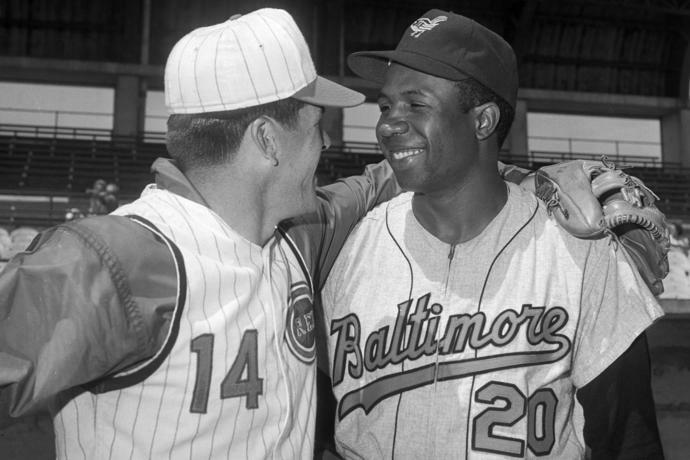 ''Frank Robinson and I were more than baseball buddies. We were friends. Frank was a hard-nosed baseball player who did things on the field that people said could never be done. I'm so glad I had the chance to know him all of those years. Baseball will miss a tremendous human being.'' - Hall of Fame slugger Hank Aaron. ''Heartbreaking news in the passing of my Dear Friend & (at)McClymondsHS classmate Frank Robinson. It was my pleasure & great honor to have known him. We all know we lost one of the Greats, what we really lost was a Friend.'' - NBA Hall of Famer Bill Russell. ''He was a trailblazer in terms of being the first African-American manager and you know he was really a great executive. He did a phenomenal job while I was in the commissioner's office. ... Frank and I had this running debate when I was the labor guy and he was the discipline guy. I think Frank thought I was the softest guy that ever lived. I was constantly telling him, 'Frank, that discipline is too hard.' And he couldn't get it. It's the all-in aspect of him. When he was doing something including discipline - he loved players, but including discipline, he wanted to do it and do it the right way, so it was effective. That's Frank.'' - Baseball Commissioner Rob Manfred. ''Frank Robinson was someone I looked up to as a man and as a ballplayer and tried to emulate. His skill and ferocity on the field were matched by his dignity and sense of fair play off the diamond. ... The fraternity of players and the baseball family have lost a giant.'' - Major League Baseball players' union head Tony Clark. ''He had great tools, and he had great desire. He beat you any way he could.'' - Hall of Fame pitcher Sandy Koufax. ''I am so sorry to hear about the death of Frank Robinson. When I was growing up, Frank Robinson was certainly one of my heroes. I remember his rookie year with the Reds when he won Rookie of the Year. ... Many years after his playing days, my son Mark and I had the chance to sit behind him at an Indians' World Series game, and he was kind to have a picture taken with Mark that we still have.'' - Ohio Gov. Mike DeWine. ''Frank Robinson is considered one of the greatest players to ever wear a Cincinnati Reds uniform. His talent and success brought dynamic change to the Reds and to our city. His retired NO. 20 and statue gracing the gates of Great American Ball Park stand in tribute and appreciation for the immense contribution Frank made to the Reds.'' - Reds CEO Bob Castellini. BUFFALO, N.Y. (AP) - His potential free agency already pushed back a year following a spring training injury, Toronto Blue Jays prospect Vladimir Guerrero Jr. says he feels ready for his major league debut. Spencer Limbach finds some sneaky-good MLB GPP Pivots away from the popular picks for Friday, April 19. Brad Johnson runs down his favorite DraftKings and FanDuel bargains for Friday, April 19.